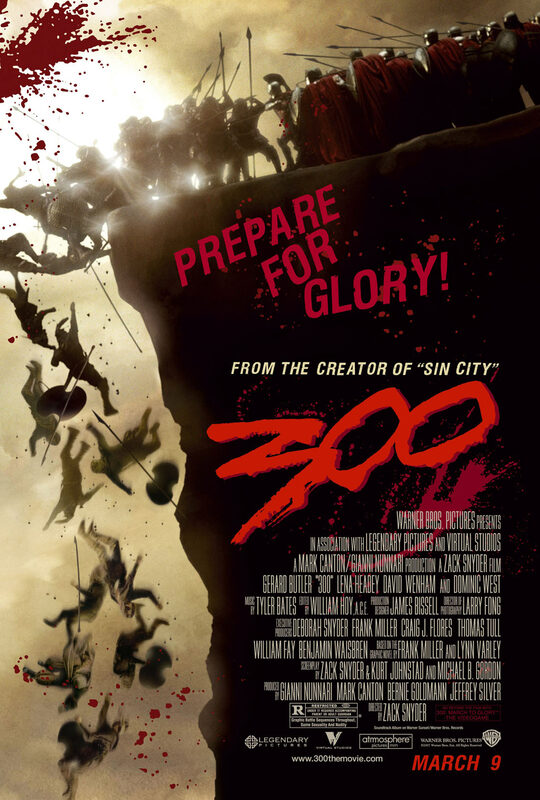 For those who might not know, this is the highly stylized account of the tale of the 300 Spartans who stood highly outnumbered by the Persian armies and held their ground long enough so that the rest of Greece could rally their troops to come back victorious, more or less, and the visual style was taken directly from Frank Miller’s graphic novel. What’s interesting is that while there were obviously some liberties taken with the story to make it seem more reasonable, the film comes fairly close to what may have actually happened in many ways. While there is rarely a clear view of exactly how many soldiers there are, Leonidas did bring 300 soldiers with him but they were joined by other Greeks who appear in the film but are really only shown in battle during one scene. Much of the culture of the Spartans is also fairly close to history when it comes to how they raise their children, how much power their women had, and their warrior culture. While this film is ten years old now, it still has a great look to it. It’s probably helped due to the highly stylized nature of the film with its golden tones in the background and the bright red from the blood and the Spartans’ capes. It does rely a little too much on what has almost become Snyder’s signature action beats where the camera will focus in on a small moment while at the same time switching to slow motion for a few seconds before returning to normal speed again. Usually this also happens during a specific battle move, like the removal of a limb, or a bloody stab through the chest. And even though the blood was obviously CGI versus any practical effects, it didn’t feel as overused as it did in Rise of the Empire. What the film does lack are an abundance of strong characters. Out of the entire 300 Spartans, there are really only five characters that we get to know, and of them Leonidas is really the only one that is a fully three-dimensional character. Next to him, there’s the old captain and his young son with his first real battle experience. There’s also a young Michael Fassbender as the cocky soldier who develops a friendly competitive banter relationship with the son. And finally there’s the narrator of the story who really doesn’t come into play during the battle until he loses his eye and gets sent home. There is also that heavily cliched moment that is predicted from the moment the son is introduced where there is a lull in the battle that causes the son to be caught unaware and decapitated. But the presence of Gerard Butler as Leonidas more than makes up for the lack of other characters. He completely owns the role of this warrior king and even the lines that have been made fun of countless times still hold the weight of his delivery. What was a little surprising after years of not watching the film was the pacing. It’s often a movie remembered for the actual battle, but Snyder does break up the action nicely with calmer scenes of exposition and dialogue. For every scene of yelling, there was one of the Spartans dealing with the dozens of bodies in the aftermath of the battle, or a scene heading back to Sparta to show Queen Gorgo’s struggles with the council. Again, some of the cliche moments come out here, like the obvious villain in the council who offers his help in return for sexual favors, but when the time comes for him to show his support, he instead throws those sexual favors in her face. And it ends up being a rather convenient reveal that shows he’s a traitor. There’s also the character of Ephialtes, the hunchback Spartan who betrays Leonidas. Initially, I didn’t care much for this character because it was another obvious set up when Leonidas denies him entry into the army because he can’t lift his shield high enough. And shortly before or after that scene, there’s a mention of the secret pass that would allow the Persians to surround the Spartans. So it’s very little surprise when Ephialtes is the one who betrays Leonidas in return for all the deformed women he could ever want. It even ends with a period appropriate insult when Leonidas tells him “May you live forever”, implying that he should never get a warrior’s honorable death. It was nice to revisit this film after so many years. It did hold up better than I thought it would have, especially after the vague memory of the mediocre sequel. It suffers a little from style over substance, but that style still has its place. Until next time, this has been Bubbawheat for Flights, Tights, and Movie Nights. Posted on January 8, 2016, in 00's movies and tagged film, graphic novel, movies, review, Zack Snyder. Bookmark the permalink. 2 Comments. Thanks, loved revisiting the film (finally! ), and congrats to you as well, 4 years ago was a good time to start a website!